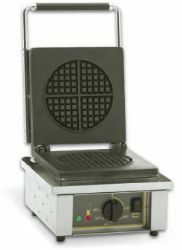 The highly conductive cast iron plates spread heat evenly and give golden, crispy waffles in 21/2 minutes. 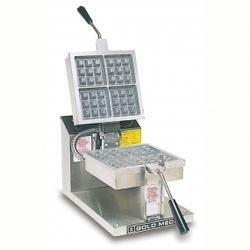 A removable drip-tray surrounding the bottom plate will collect any batter excess thus making it easy to clean. Equipment : on/ off switch, thermostat 0 - 300°C, pilot lights, adjustable feet. We are offering IHX 2208 Waffle Iron to our client. A choice of waffle irons & cone bakers from Celfrost that accept deep-frozen, frozen pre-cooked waffles or homemade batter for making golden crispy waffles. A choice of Waffle Irons and Cone Bakers that accept deep frozen, frozen pre cooked waffles, and hme batter to make golden crispy waffles. Features: commutator-thermostats 0-300 C,control lights. Delivered with a brush (F05054) and a timer. Our company is widely appreciated in offering Waffle Iron. Price will be quote as per quality & size of the product. Hence, price is fluctuating. A choice of Waffle Irons & Cone Bakers that accept deep-frozen, frozen pre-cooked waffles or home­ made batter for making golden crispy waffles.